Most Italian restaurants in North America offer the same dishes: Lasagna, spaghetti bolognese, pizza, and gnocchi. Did you know that vacation experiences in Italy are your opportunity to discover Italy’s diverse regional foods? 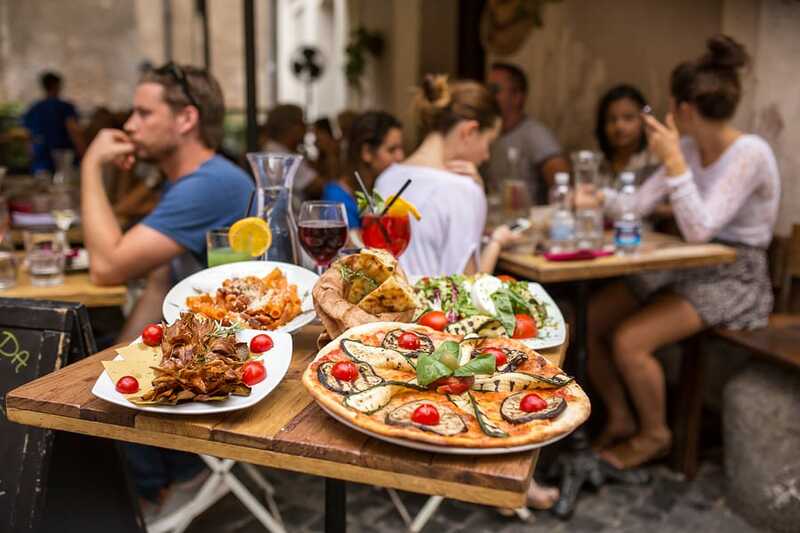 Just as Americans eat more than just hamburgers and apple pie or Canadians maple syrup and back bacon, the foods you will encounter during Italy Tours and Italy vacation packages will vary region to region. Which major city do you find in Italy across the border from Switzerland? Fashionistas know! Milan, of course. Whether you book our popular Private Walking Tour of Milan or a vacation package such as our Milan, Lake Como, & Venice Tour, watch for the cheeses, rice or polenta dishes, and wild game native to the Lombardy region. It’s probably not surprising that Italians this close to the Swiss with their love of fondues know a thing or two about exquisite cheese. You must try some local cheeses while you are in Milan; ask for Formaggio latteria to taste the local cheeses. Rice dishes simmered with vegetables and meat are the local specialty, savory and delicious. Game meat is a staple throughout all mountain cities across Italy, especially veal, rabbit, or quail, but in cities like Milan you can also eat wonderful fish. Milanese aperitifs are like a meal and typically for a fixed price you can eat your fill. Drink orders are taken at the table. If there is one dish we recommend you try in Milan it has to be the Milanese specialty Risotto allo Zafferano con Osso Buco. Tender veal shanks are first browned and then slow cooked in broth and tomatoes with onion, celery, carrots, and spices like garlic, bay leaves, and parsley. The meat and sauce are served with saffron risotto. For wine, ask for Vino della Casa (the house wine) if you don’t want to have a full bottle of wine. If you are happy with a carafe of half a litre or less it is generally quite good and more economical. When you are in northern Italy you can also ask for a special after dinner coffee called caffe’ corretto. This is a delicious caffe’ espresso with a drop of grappa (brandy). The Veneto region - the capital of which is Venice, the beautiful city of canals - has quite a bit of variety in cuisine depending whether you are near the coast, on the plains, or in the mountains. When you are enjoying Venice day tours you can sample many different selections, ranging from abundant seafood (eels, fish, clams, and shrimp to name a few) inspired dishes in the city of Venice, to grilled meat and potatoes or stews in the plains (duck and pork are popular), and polenta or fresh pasta with meat sauce, cheese, and mushrooms in the mountains. This region is where you find the delectable Asiago cheese. When you are in Venice we have to recommend you try the popular appetizer sardine in saor (sweet and sour sardines). It is delizioso! A main course a specialty for anyone who wants to eat like a true Venetian is liver alla veneziana cooked with onions and served with polenta. For dessert? Tiramisu of course. Just be warned that once you’ve tried this coffee-flavored dessert here made with real Italian mascarpone cheese it may never taste as good back home. Excellent Veneto wines to try with your meal are Prosecco or Valpolicella wines, including Amarone. If you’ve enjoyed fish for your meal, ask for a sgroppino. This special sorbet is made of lemon and vodka, which is not only tasty but a great digestif. Italians consider this ancient city to be the food capital of their country. In the 1970s the city took steps to secure the integrity of the historic city center. Our Private Bologna Walking Tour takes travelers through the remarkably preserved and restored urban area, with its famous towers, porticoes, and monuments, pointing out the examples of medieval, Renaissance, and Baroque architecture. In addition to the stunning artwork, this historically significant city is a great gastronomic adventure as well. When you see the array of restaurants alongside magnificent food markets full of cured meats, cheeses, cakes, bread, and vegetables in the downtown it is easy to see why Bologna earned its nickname La Grassa (the fat one). This is the birthplace of delights of not just the rich Bolognese sauce but of mortadella and tortellini (oh, the fillings you’ll find here!). We recommend you try Lasagne alla Bolognese, which is heavenly. Chefs vary the recipe according to their own preferences but typically this classic dish is lasagna made with Ragu alla Bolognese and Béchamel Sauce with a blend of Provolone and grated Parmigiano-Reggiano cheeses. Another wonderful option - aside from any of the incredible options for tortellini - is Fetuccine alla Bolognese. This hearty pasta dish is covered generously with the carefully stewed meat sauce stewed with wine, garlic, nutmeg, onions, and other vegetables. Should you book Cinque Terre tours or day trips, don’t expect the same seafood on the riviera as you would enjoy near the Adriatic. Here in the Liguria region the signature dish is basil pesto sauce. While in Genoa pesto accompanies Trenette pasta, it is more popular paired in Cinque Terre with Trofie. Catch of the day in Cinque Terre is also more likely to range from anchovies to tuna, sardines, sea bass, or sardines. Veal and rabbit are also staples in the kitchen in this area of Italy. While you are on the Amalfi Coast you should try Limoncello liqueur, especially as a digestif after dining on fish or seafood. This liqueur, made from the zest of Sorrento lemons, has been produced in this area for more than a century. It is extremely popular among locals and visitors and is usually served chilled. If you want to try a delicious local dessert specialty, ask for Baba’ al Rhum (a small yeast cake filled with whipped cream and soaked in rum) or Pastiera Napolentana (a traditional cake made with Ricotta cheese and eggs, rich with citrus flavor and spices). When your holiday to Italy includes Florence tours, the menu will incorporate some of the country’s very finest olive oils. Crusty fresh baked bread is a staple at the table, as are cheeses made using sheep’s milk. Freshly grown local vegetables such as tomatoes, onions, and herbs like basil will be used to create delicious, hearty soups and salads to compliment perfectly grilled steak or lamb. For a truly Tuscan meal we recommend you try Ribollita, a famously hearty traditional soup believed to date back to the Middle Ages that is made with bread, vegetables, and beans. Typical meal starters, antipasti, are salumi (cold cuts) and pecorino cheeses. A wonderful choice for main course is Bistecca alla fiorentina, the signature grilled steak of the region. Tuscany’s Chianina cattle are prized for their tender and flavorful meat, which for this dish is seasoned with olive oil, rosemary, and salt and then grilled to perfection. For dessert, consider what is arguably Tuscany’s most famous pairing for after dinner: Catuccini biscuits with Vin Santo. These delectably crunchy biscuits, formally biscotti di Prato because they originated in a bakery in Prato near Florence, have not lost popularity since they first won prizes in the 1800s. They are served with a glass of the Tuscan dessert wine called Vin Santo, which is made from dried malvasia and trebbiano grapes, and aged in wooden barrels. Note that while you won’t see Italians dipping biscotti in their coffee as non-Italians are tempted to do, they will dip cantuccini into Vin Santo. Try it and you’ll see why! The Lazio region, where you will find yourself if you book any Rome tours or vacation packages, is a great destination for pasta lovers as it is celebrated for both its dried and fresh pastas (spaghetti alla carbonara anyone?). If you like artichokes, you are in luck because they are popular in many dishes in the eternal city. One inspired artichoke dish found in the Jewish district restaurants is called Carciofi alla giudia (Jewish-style artichokes). This specialty deep-fried artichoke is extremely popular in spring because the artichokes used for it are harvested in February to April. To dine like the locals, when in Rome you should try Saltimbocca alla Romana, which is veal and prosciutto rolled up with sage for flavor and then cooked in butter and wine, or Bucatini all’ Amatriciana, which is pasta with a traditional spicy sauce made with guanciale (salt-cured pork jowel), tomato, and pecorino cheese flavored with garlic, pepper, and crushed red peppers. So where do you find pizza? The birthplace of pizza is Naples, in the Campania region. And spaghetti bolognese? In Bologna of course, which you find in the Emilia-Romagna region of northern Italy. One thing is certain, all vacation experiences in Italy feature great food and a wonderful atmosphere, no matter where your journey takes you! Treat your tastebuds to a spectacular gastronomic holiday in Italy. Contact the tour specialists at Avventure Bellissime for helpplanning an Italian vacation.